gajar halwa can be easily made in a pressure cooker. this is an easy and a less time taking recipe of preparing delicious gajar halwa in a pressure cooker. first thinly slice or chop 1 tablespoon cashews (kaju), 1 tablespoon almonds (badam) and 1 tablespoon pistachios (pista). also powder 4 to 5 green cardamoms and keep aside. rinse, peel and grate carrots. you will need about 4 to 4.5 cups grated carrot (gajar). take the grated carrots in a 2 litre pressure cooker. also add 2 cups full fat milk, ½ cup sugar, 4 tablespoons ghee, 1 tablespoon raisins (kishmish) and sliced or chopped dry fruits. 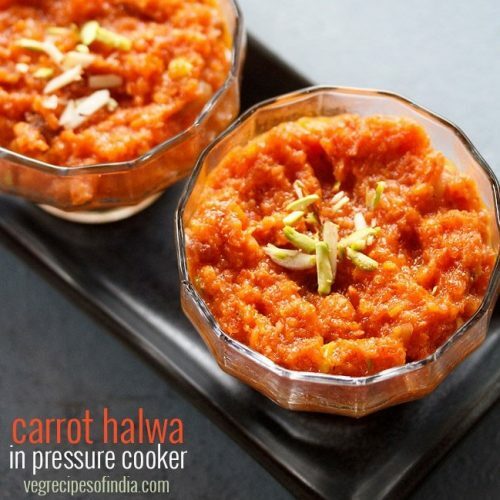 mix well and pressure cook the carrot halwa mixture till the pressure builds up in the cooker. so this is when you get the first whistle or about to get the first whistle. takes about 20 to 25 minutes on a low to medium-low flame. stir the mixture and keep the cooker on a medium-high to high flame. begin to cook the gajar halwa more, so that it thickens. when the mixture starts bubbling, then add ½ teaspoon cardamom powder (choti elaichi powder). stir at times and let the gajar halwa cook on a medium-high to high flame till the mixture thickens. then switch off the flame. serve gajar halwa hot or warm in the winters. almond milk can be used instead of dairy milk. soy milk can also be used, but the flavor of soy milk will be there in the gajar halwa. you can add less or more dry fruits as per your requirements. also your choice of dry fruits can be added. recipe can be doubled. use a 4 to 5 litre pressure cooker if doubling the halwa recipe. sugar can be added as per your requirements.